Writing can be a lot of fun. But there are days it can be exhausting. And I am not talking about the writing process – brainstorming ideas – multiple edits – final version. But the hundred and one interruptions that pop while writing. It could be your boss or colleagues at work or your kids and pets at home. And then that easy as pie article which was to take one hour, will now take 5! End result, you are mentally pooped; your eyes burn, your brain spins and your mood, has gone from mildly pleasant to borderline violet. If this is you, don’t despair as most writers experience a complete burnout once in a while. While some have learned to cope and streamline the writing process, others have given it up teaching yoga. If you want to avoid burning out, here are three easy steps for you to follow. Walk your dog, if you don’t have a dog, walk yourself. Not the brisk exercise kind of walk that leaves you panting but a stroll in one of the better parts of town. Not only is this good for you physically but it will relax you. Sometimes just watching others go about their life, can be soothing and help get rid of writers block. Many writers want to just crouch in front of their laptops and not budge till they’ve competed their work. Not taking frequent breaks is extremely hazardous to health. You may not realise it but the early signs of burnout are often ignored; watery eyes, pain in the wrist and fingers, back and knee aches. Instead of attending to this, most writers just wash their face, do a few neck stretches and get back to work. While many get away with this some are not so fortunate. They need to get their wrist operated or have their corneas replaced thanks to constant neglect. If you want to succeed as a writer, you need to give your tools constant TLC. Every 30 minutes you need to get up from your desk, do a little stretch, walk around, and do eye exercises. Even a two-minute break will help your body to relax. What can be nicer than catching up with friends over a quick cup of coffee. Many leave their social exploits for the weekend but if you can fit a lunch or coffee date in the middle of the week it will really help you unwind. Choose your midweek friends carefully, this outing is to help you relax and take a break from work not to get you embroiled in their family or office dramas. 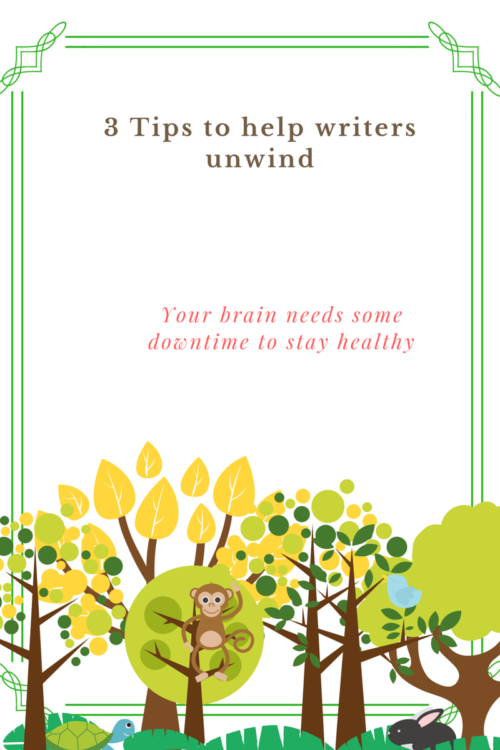 If you go out with whinny friends they are going to do all the unwinding and when you get back to work, their problems will have become yours and you won’t be able to work. Leave the friends with problems for weekends and choose the funny ones. These are small and easy ways to help you unwind during or after work. Don’t feel guilty for taking breaks or meeting friends. Feeling good and positive about yourself will increase your productivity and make you a writer that loves writing.